Today, everyone has so many options for who they are going to be in this world. It used to be that you would go to work for one company and do one job until you retire. Today, that is not the case. Everyone is bombarded with so many options for who they are going to be and what they are going to do in this world. Even if they are in a job where they know who they are, the options within their position or company are endless. Because people have so many options, they get stressed and they are missing the skills to help them deal with that stress. The tools your team needs today are mindfulness and meditation. Daniel Goleman, author of Emotional Intelligence, explains in his article Mindfulness as a team sport that team mindfulness reduces conflict and increases focus. Meditation helps not just your personal inner game, but has significant benefits to your whole team. Julie Hunt, owner of alittlemeditation.com, and I recently co-led a team building meditation retreat with one of my highest performing teams in San Diego. This team is made up of high performers who accomplish and hit insanely high goals year after year after year. They work in a fast-paced, highly stressful environment and they largely credit their success to their continual dedication to team building. Even after reaching such high levels of performance, this team is always looking for tools to help them improve. Over the course of many years they have completed many team building retreats with me, but none of them were like the meditation retreat we did. You see, powerful leadership comes from a strong inner game. If a leader is defined as someone who creates a future other people emotionally commit to, this proves that leadership is not only an intellectual pursuit. In fact, leadership includes an intellectual dimension, an emotional dimension, a physical dimension, a spiritual dimension and a relational dimension. The intellectual, emotional and spiritual dimension make up your inner game. In the spiritual dimension, we define spiritual as exploring that sense of higher meaning that most of us eventually come into contact with. It could include things like finding your purpose (why are you here?) understanding who you truly are and what you stand for in life. This spiritual aspect is the foundation of finding out what you do for a living and how you should be leading as a leader. It’s through having tools like meditation that can really help leaders become more present, have better mental clarity, increase their self-awareness, and strengthen their inner game, so that they can go out into the world and really live out their full potential. What we found so powerful about this meditation retreat was that in order for these high performers to further drive their success, they actually need tools like meditation to improve their inner game: to help reduce their anxiety, their stress, and increase their self-awareness. For high performers like this team, in order to drive further success, they actually need to STOP for seven minutes a day, and meditate. The world we live in is non-stop so the only way that we increase our productivity to focus on our mental clarity. 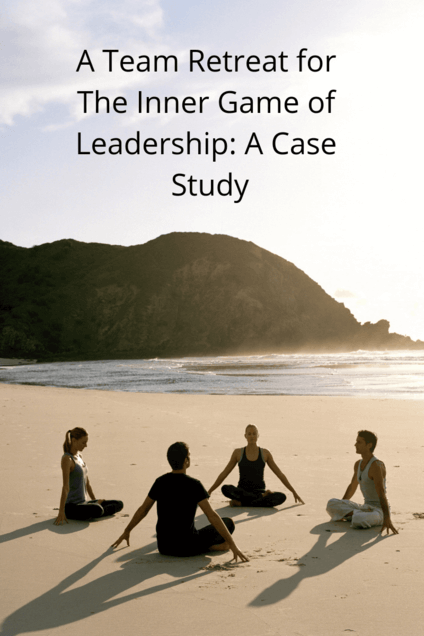 This is where the world of meditation and the world of leadership collides. In this 2-hour retreat, Julie gave this team simple instructions so that they can walk away and begin practicing and reaping the benefits of meditation. We focused on the team element so that the team can build accountability within each other to encourage their success in actually meditating after the retreat and every single participant left committed to adding meditation into their daily schedule. A week after the retreat, we followed up with the team in an anonymous survey to see how they were doing. 100% of them were still committed to meditation and many of them explained that they have already been noticing the benefits of meditating daily. The hardest part for the participants is staying committed to the daily practice, which is true for every leadership practice. It’s not the knowledge that is hard, it’s the commitment to practicing. Meditating reaps many benefits for leaders and for teams and many leading companies understand this connection between meditation, performance, and even employee engagement.